The burden of MNS disorders is large, growing, and underestimated. The public health burden of MNS disorders, as estimated by disability-adjusted life years, is on a sharp upward trajectory; it increased by 41 percent between 1990 and 2010 and now accounts for one in every 10 years of lost health globally. Many MNS disorders can be prevented and treated effectively. A wide variety of effective interventions can prevent and treat MNS disorders and have significant impacts on other global health and development priorities. Best practice interventions for MNS disorders can be appropriately implemented across a range of population, community, and health care delivery platforms. Public financing of scaling-up is affordable and increases financial protection. The costs of providing a significantly scaled-up package of specified cost-effective interventions for prioritized MNS disorders is estimated at US$3–US$4 per capita per year in low- and lower-middle-income countries, and at least double that in upper-middle-income countries. "We, as global leaders, have a moral obligation to advocate for comprehensive, effective services backed by human-rights-oriented legal frameworks to protect those living with MNS disorders as part of this quest toward meaningful universal health coverage. Prioritizing the supply of quality MNS services at the community level while also improving the demand for such services must come with this advocacy effort." 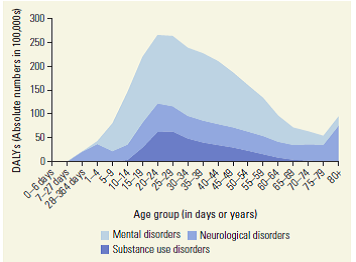 The burden of mental, neurological, and substance use (MNS) disorders increased by 41% between 1990 and 2010 and now accounts for one in every 10 lost years of health globally. The 7th annual Consortium of Universities of Global Health (CUGH) conference featured two DCP3 volume presentations: Reproductive, Maternal, Newborn, and Child Health (Volume 2); and Mental, Neurological and Substance Use Disorders (Volume 4) on April 9 and 11, respectively. Volume citation: Patel, V., D. Chisholm., T. Dua, R. Laxminarayan, and M. E. Medina-Mora, editors. 2015. 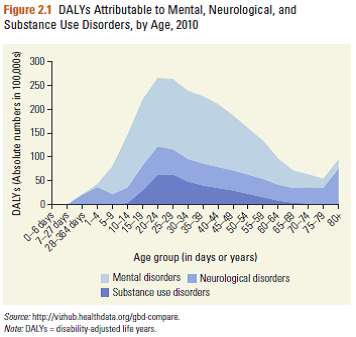 Mental, Neurological, and Substance Use Disorders. Disease Control Priorities, third edition, volume 4. Washington, DC: World Bank.